Dimensions (HxWxD): 36.5" x 19.5" x 18.5"
The Swingline™ CM15-30 is a commercial micro cut shredder; micro cut being securer than cross cut. The Swingline™ shredder is TAA compliant, ideal for purchasing with government funds. 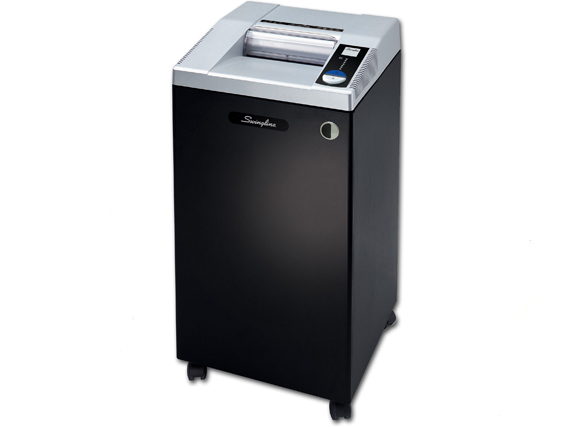 The Swingline™ shredder can shred paper, optical media, credit cards, staples, and paper clips. The Swingline™ CM15-30 micro cut shredder's Jam-Stopper® technology automatically reverses during paper jam; with manual reverse also an option. The Jam-Stopper® shredder features thermal overload protection that ensures the motor doesn't get hot. The Jam-Stopper® shredder also features continuous shredding duty cycle. The Swingline™ CM15-30 micro cut shredder features a wire-frame waste bin that uses both plastic or paper bags; with a bag full indicator. JamStopper® technology prevents paper jams. Cut Size 3/32" x 5/8"